Park View Condominiums at Greenbrier community is sold out and is not in active development by builder. If you are interested in Park View Condominiums at Greenbrier or similar new home communities, contact us today! Our agents are very familiar with new and newer construction in Chesapeake, and can identify resale opportunities in Park View Condominiums at Greenbrier, as well as builder inventory available in nearby or similar communities in Chesapeake. To view 7 more pictures, interactive maps and the full, detailed description of the Park View Condominiums at Greenbrier community, please Login. Today’s homebuyer can find new homes in the condo complex of Park View Condominiums at Greenbrier. This new construction development combines affordability with upscale amenities in these impressive homes. Conveniently located in the Greenbrier area of Chesapeake, VA, this community rests in the heart of Hampton Roads. 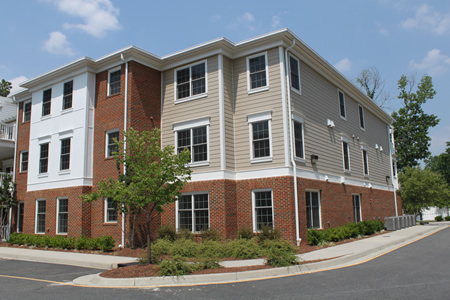 Residents can easily drive to Chesapeake Regional Medical Center and military bases such as Norfolk Naval Shipyard, NAS Oceana and Naval Medical Center Portsmouth. In the current real estate market, it is not so simple to find new homes with all the bells and whistles and still come under budget. Well now there’s Park View Condominiums at Greenbrier. Each new construction condo here includes pocket doors, crown molding, chair rail, electric fireplace, hardwood flooring, ceiling fans, wall safe, Frigidaire stainless steel appliances, cherry kitchen cabinetry, Kohler faucets, granite countertops, 40-year architectural shingles, covered balcony and much more. In addition to having some upgrades that come standard with these new construction units, this complex also gives peace of mind. The main lobby has a buzz-in door system, the front entrance is gated and security lighting is installed both on the interior and exterior for additional safety. Park View Condominiums at Greenbrier encourage active lifestyles with their fitness facility complete with cardio and strengthening equipment. Condo owners can access a bar, library, TV and game tables in the community room. This region of Virginia continues to explode with growth. Those relocating come to find new homes and check out the Chesapeake area. Those wanting to get some fresh air can head over to Chesapeake City Park or Oak Grove Lake Park. Shopping, dining and entertainment is everywhere you look in Greenbrier so an enjoyable day can turn into an exciting night without even realizing it. When wanting to find new homes, start with a development that has everything on those wish lists. Living in a condo here puts the fun back in real estate. Park View Condominiums at Greenbrier doesn’t just satisfy; this complex goes above and beyond to please new construction homebuyers. Send me more information about communities similar to Park View Condominiums at Greenbrier. Our agents gladly offer FREE property tours of Park View Condominiums at Greenbrier, Chesapeake and homebuyer consultations to all serious buyers.